The Cedar Mill and Bethany Community Libraries Association (CMBCLA) grew from a need to provide library services to the Cedar Mill community. A great deal has changed since 1974 when volunteers established the Association as a 501(c)(3) nonprofit organization. The demand for library services in unincorporated Washington County was strong enough for the association to expand to Bethany in 2007. The Association is the managing entity that leads the Cedar Mill and Bethany Community Libraries, Second Edition Resale Shop , and our ongoing Book Sale. Unlike a “Friends” organization solely responsible for fundraising, the Association guides the libraries and ensures they remain responsive to community needs. 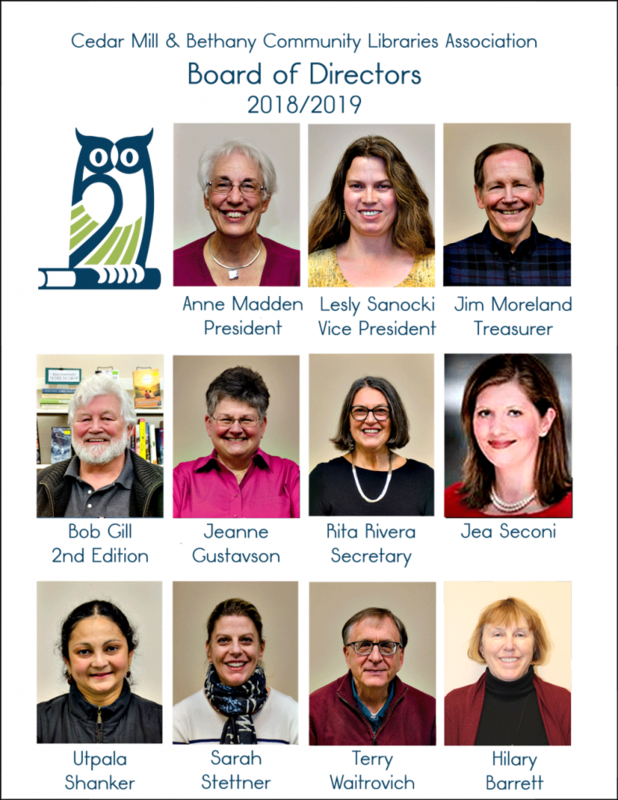 Each of the 11 members of the Board of Directors serves a 3-year term during which they attend monthly board meetings, serve on standing committees, fundraise, recruit potential board members, and act as ambassadors for the libraries. The Board normally meets on the 3rd Tuesday of each month at 7:00 pm at Cedar Mill Library. Board meetings are open to the public. Interested in joining the Board? Board members are elected from our membership group. Become a member of the Association by making a donation. The Association has been named one of the 100 Best Nonprofits by Oregon Business Magazine and aims to operate ethically, efficiently and transparently. Financial reports and 990 filings are through Guidestar.Org or by request through the business office or Executive Director. The Cedar Mill Community Libraries Association is a 501(c)(3), nonprofit organization dedicated to providing public library service in Cedar Mill and Bethany communities in unincorporated Washington County, Oregon.